This entry was posted in Kindle 2 Hacks, Kindle Hacks, Kindle Mod, Kindle Tips & Tricks and tagged mobileread forums, screensaver, updating kindle software by Dzmitry. Bookmark the permalink. Mac users, beware: When writing to a FAT32 filesystem, which the Kindle is, Mac OS X will write an extra hidden file along side each file you can see. The Kindle is trying to use those files as images and, since they are not images, it displays a blank screen. If anybody knows a better way to keep those files from being written in the first place, please add a comment here. I don’t have a Mac so I wouldn’t know about this detail. What do these files contain? They contain the resource fork. I’ll avoid boring everyone with too much detail, but in short any file on a Mac can have both the traditional stream of bytes such as a jpeg image, and a more database like store of objects such as icons, executable code, and sounds. For these png or jpeg images, all they contain that is useful is their association with the program that created them and maybe a thumbnail image for quick viewing. Since resource forks are exclusively a Mac OS thing, in order to store it safely on other file systems it uses a hidden file in the same directory with a “._” prefix. Fortunately, resource forks are quickly becoming a historical footnote about the Mac OS. Most ordinary files don’t use them anymore, and applications are preferred as bundles. But for now, they’re still around. Screen Saver Hack 0.3 successfully applied to Kindle 2.0.2 (309510017). Great website and thanks for the instructions. To disable the resource forks on Kindle and other devices, the option I used was to purchase Blue Harvest: http://www.zeroonetwenty.com/blueharvest/ which actively blocks resource forks and other “Mac” files from being written to connected devices (customizable too). I got tired of “trashes” folders eating up camera memory and found this solution to work well for stopping other files like .ds_store and .spotlight files as well as those resource forks. I have no affiliation to Blue Harvest. This is great; thanks! On a similar note: is there a way to change the boot image (the Amazon logo)? 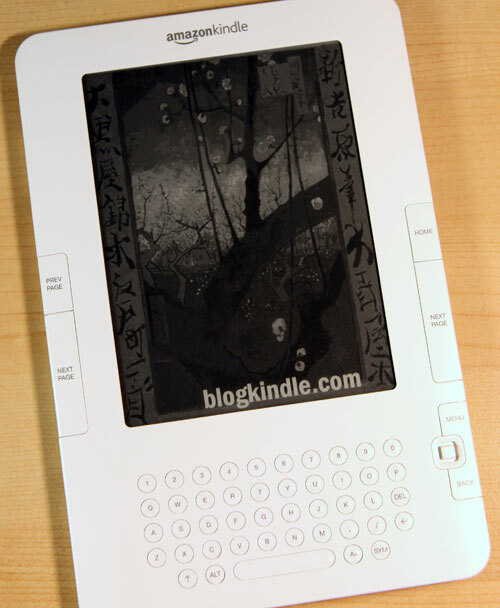 Is there any way to set the Kindle 2 so that the screensaver is automatically the cover of the book you’re reading? Or even do so manually? Hmm… it doesn’t look like it “took” on the Kindle DX — the option to “Update your Kindle” appears grayed out after the update_kindle2_user_screen_savers.bin file is copied to the root and the kindle is removed from the USB connection. Restarting also had no effect. Thanks for the info Jeff. I have a Mac so this helps a lot. I am a mac user. I am getting the hidden file(blank screen saver) I still can’t figure out how to delete the non picture hidden file. It’s really annoying. can I get some info in lame mans terms. thanks.GREAT HACK. It works nicely. I would like to write a Mac version of this utility which would not only apply/remove the changes, but also transfer files and handle the resource fork issue so folks don’t have to worry with that anymore. Would you be willing to share with me the changes you are making to the Kindle? Is there a hack to have my Kindle 2 simply continue to display the last page it was on when powering down (via either the timer or the switch)? I’m not aware of something like this but this would definitely make a great idea. I’ll look into it. does this slow down my kindle 2? After downloading Kindle 2.3 update, I cannot change the screensavers back to my own personal screensavers – is there an updated screensaver hack version? There is an updated screensaver hack. Take a look at mobileread.com forums. Putting together some images sized for the Kindle 2 here. Mostly going to be book covers and movie posters. I have a couple up right now, a Harry Potter one and an Arthas one. Hi, I’ve got a Kindle 2, and Windows Vista. I’ve done the instructions, made my screen_saver folder and copied the .bin to the root directory. When I unplug my Kindle from my computer and try to update it, the “Update your Kindle” option is not available to select, and therefore I cannot finish the process. Any idea what’s going on? I have a Kindle 2 International with firmware version 2.3. The screensaver hack seems not working on this version. The device doesn’t see the bin file as a valid update file so the option is gray out. Is there a newer version of screen saver hack? Thanks. Anyone know if this works on a Kindle 3? If not, any suggestions? does this work on the basic kindle 4th generation?